One of the biggest volcanic eruptions in recorded history, which is said to have contributed to the downfall of the ancient Minoan civilisation, may have happened later than previously thought, according to new research. 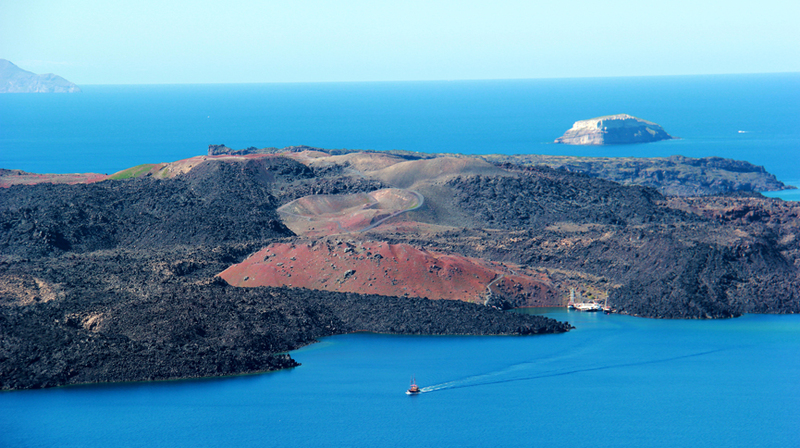 The study, led by the University of Arizona in collaboration with scientists at the University of Sheffield, has potentially settled a long-standing debate between archaeologists and radiocarbon scientists over the date of the eruption of Thera – a volcano on the island of Santorini. The catastrophic eruption, which radiocarbon scientists previously believed had occurred sometime between 1627 and 1600 BC, is thought to have been the inspiration behind several ancient Greek myths and is a key marker to tie together European history in the Bronze Age. Thera’s explosive eruption buried the Minoan settlement on the island of Santorini in a layer of ash and pumice more than 130 feet (40 metres) deep. The effects of the eruption were felt as far away as Egypt and what is now Istanbul in Turkey. Archaeologists and scientists have argued for decades over the exact date that the eruption occurred. Previously, scientists estimated the date of the eruption to between 1627 and 1600 BC using measurements of radiocarbon, sometimes called carbon-14, from bits of trees, grains and legumes found just below the layer of volcanic ash. However, archaeologists disagreed. They believed the eruption must have occurred between 1570 and 1500 BC based on human artefacts, such as written records from Egypt and pottery retrieved from digs. Now, a University of Sheffield mathematician together with researchers from the US have used radiocarbon measurements from the annual rings of trees to determine a more accurate date for when the eruption took place, allowing archaeology and radiocarbon science to agree for the first time. Results from the study, published in Science Advances, suggests the eruption occurred between 1600 and 1525 BC. Aside from providing new insights into the date of the ancient eruption, the research will now be used to create the new international standard radiocarbon calibration curve. This curve, which Sheffield is also helping to develop, is crucial to investigating the timings and rates of change of events in human and environmental history.